Long ago the first Hawaiians made a transition from explorers to settlers. They created a complex and unique society that was able to feed about a million people in a sustainable manner, without waste or extensive harm to the environment. Kalo (taro), and seafood from the ocean and shorelines were the staples of the Hawaiian people. Kalo or taro production in rock-enclosed flooded lo`i (taro terrace pond) extended from mauka (mountain) to makai (ocean). Our ancestors observed that fish would often congregate near openings in the rock walls of makai lo`i next to the shorelines. This sprung the idea of capturing and raising aquatic life in fishponds (loko i’a). These systems contained a variety of wildlife (crustaceans, fish, shellfish, turtles) and could produce up to 600 pounds of food per acre each year. The ali’i (rulers) often chose and selected seaweed (limu and ogo) for cultivation in certain loko i’a for convenience. What is seaweed? Seaweed is a common name for many species of marine algae. Distinguished by their pigment content they are divided into three phyla, the Brown Phaeophyta – brown algae, Chlorophyta – green algae, and Rhodophyta - red algae. As a group, seaweed has nutritional value as a food, pharmaceutical value, and industrial value. It has been used as a food source dating back to 2700 B.C. in China and 1200 A.D. in Ireland. Use of seaweeds as an agricultural fertilizer is a common practice in coastal regions of the world. The value of seaweed is due to it content (nitrogen, phosphorus, potash, trace elements, plant hormones (abscisic acid, auxins, cytokinins, and gibberellins), hormone-like regulators (betains, brassinosteroids, jasmonates, polyamines, and salicylates), vitamins, amino acids, signal peptides, and trace elements (Fe, Cu, Zn, Co, Mo, Mn, and Ni). Seaweed is used directly and after processing for fertilizing crops. 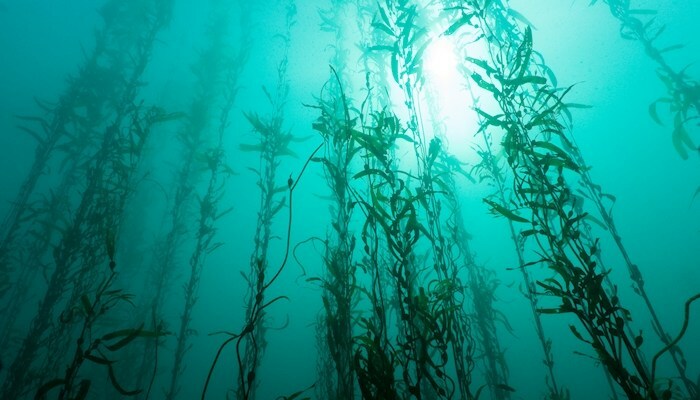 Several genera and species of seaweed are processed and marketed as fertilizer. Ascophyllum nodosum is one of the most commonly used species due to its nutritive and plant enhancing benefits. It is absorbed through roots, leaves, and releases trace elements that are bound to the soil. It promotes seed germination and seedling growth, increases plant growth and yields, improves nutrient uptake, and increases leaf chlorophyll levels. These effects have been reported for a large number of plants and with little negative impact on humans, animals, and the environment. So while ancient Hawaiians grew limu and ogo for food, today we can use seaweed to produce greater quantities of quality food.